Evil inclination or impulse, popularly identified with the lusts of the flesh. The idea is derived from Gen. viii. 21: "the imagination of the heart of man is evil from his youth." Yet from the use of the two "yods" in Gen. ii. 7, the Rabbis deduced that there are in man two Yeẓarim: the good (Yeẓer Ṭob) and the evil (Ber. 61a). Cain defended himself before God for having slain Abel by arguing that God had implanted in him the Yeẓer ha-Ra'(Tan., Bereshit, 25 [ed. Buber, p. 10]). "It lies at the door of the heart like a fly" (Ber. 61a; comp. Beelzebub). Yet in a way the Yeẓer ha-Ra', like all things which God made (Gen. i. 31), is good. Without it, for example, a man would never marry, beget, build a house, or trade (Gen. R. ix. 9). Therefore, man is enjoined to love God with both the Yeẓarim implied in "with all thy heart" of the Shema' (Sifre, Deut. 32 [ed. Friedmann, p. 73a]). It would appear that the Yeẓer Ṭob comes with reflection, and at the age of bar miẓwah or confirmation, because it is said to be thirteen years younger than the Yeẓer ha-Ra', which is an inborn impulse (Eccl. R. ix. 14). The Yeẓer Ṭob delivers the citadel of the body from the Yeẓer ha-Ra' by means of temperance and good works (Ned. 32b). The "little city" of Eccl. ix. 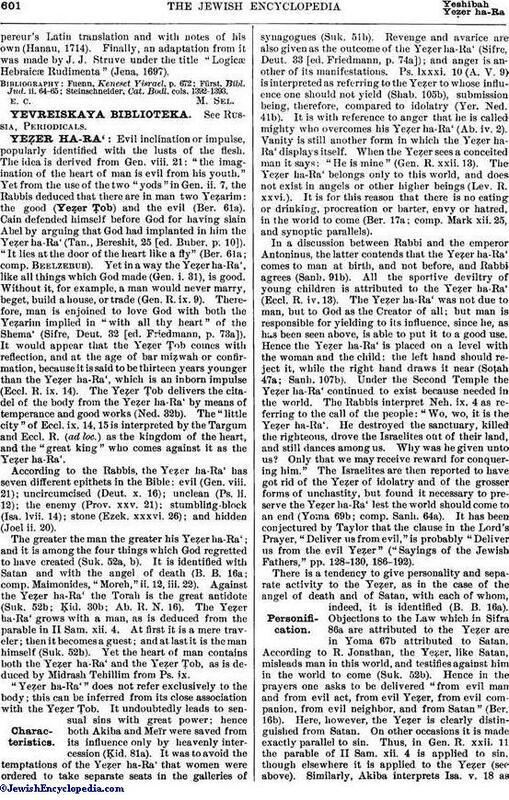 14, 15 is interpreted by the Targum and Eccl. R. (ad loc.) as the kingdom of the heart, and the "great king" who comes against it as the Yeẓer ha-Ra'. According to the Rabbis, the Yeẓer ha-Ra' has seven different epithets in the Bible: evil (Gen. viii. 21); uncircumcised (Deut. x. 16); unclean (Ps. li. 12); the enemy (Prov. xxv. 21); stumbling-block (Isa. lvii. 14); stone (Ezek. xxxvi. 26); and hidden (Joel ii. 20). The greater the man the greater his Yeẓer ha-Ra'; and it is among the four things which God regretted to have created (Suk. 52a, b). It is identified with Satan and with the angel of death (B. B. 16a; comp. Maimonides, "Moreh," ii. 12, iii. 22). Against the Yeẓer ha-Ra' the Torah is the great antidote (Suk. 52b; Ḳid. 30b; Ab. R. N. 16). The Yeẓer ha-Ra' grows with a man, as is deduced from the parable in II Sam. xii. 4. At first it is a mere traveler; then it becomes a guest; and at last it is the man himself (Suk. 52b). Yet the heart of man contains both the Yeẓer ha-Ra' and the Yeẓer Ṭob, as is deduced by Midrash Tehillim from Ps. ix. "Yeẓer ha-Ra'" does not refer exclusively to the body; this can be inferred from its close association with the Yeẓer Ṭob. It undoubtedly leads to sensual sins with great power; hence both Akiba and Meïr were saved from its influence only by heavenly intercession (Ḳid. 81a). It was to avoid the temptations of the Yeẓer ha-Ra' that women were ordered to take separate seats in the galleries of synagogues (Suk. 51b). Revenge and avarice are also given as the outcome of the Yeẓer ha-Ra' (Sifre, Deut. 33 [ed. Friedmann, p. 74a]); and anger is another of its manifestations. Ps. lxxxi. 10 (A. V. 9) is interpreted as referring to the Yeẓer to whose influence one should not yield (Shab. 105b), submission being, therefore, compared to idolatry (Yer. Ned. 41b). It is with reference to anger that he is called mighty who overcomes his Yeẓer ha-Ra' (Ab. iv. 2). Vanity is still another form in which the Yeẓer ha-Ra' displays itself. When the Yeẓer sees a conceited man it says: "He is mine" (Gen. R. xxii. 13). The Yeẓer ha-Ra' belongs only to this world, and does not exist in angels or other higher beings (Lev. R. xxvi.). It is for this reason that there is no eating or drinking, procreation or barter, envy or hatred, in the world to come (Ber. 17a; comp. Mark xii. 25, and synoptic parallels). In a discussion between Rabbi and the emperor Antoninus, the latter contends that the Yeẓer ha-Ra' comes to man at birth, and not before, and Rabbi agrees (Sanh. 91b). All the sportive deviltry of young children is attributed to the Yeẓer ha-Ra' (Eccl. R. iv. 13). The Yeẓer ha-Ra' was not due to man, but to God as the Creator of all; but man is responsible for yielding to its influence, since he, as has been seen above, is able to put it to a good use. Hence the Yeẓer ha-Ra' is placed on a level with the woman and the child: the left hand should reject it, while the right hand draws it near (Soṭah 47a; Sanh. 107b). Under the Second Temple the Yeẓer ha-Ra' continued to exist because needed in the world. The Rabbis interpret Neh. ix. 4 as referring to the call of the people: "Wo, wo, it is the Yeẓer ha-Ra'. He destroyed the sanctuary, killed the righteous, drove the Israelites out of their land, and still dances among us. Why was he given unto us? Only that we may receive reward for conquering him." The Israelites are then reported to have got rid of the Yeẓer of idolatry and of the grosser forms of unchastity, but found it necessary to preserve the Yeẓer ha-Ra' lest the world should come to an end (Yoma 69b; comp. Sanh. 64a). It has been conjectured by Taylor that the clause in the Lord's Prayer, "Deliver us from evil," is probably "Deliver us from the evil Yeẓer" ("Sayings of the Jewish Fathers," pp. 128-130, 186-192). There is a tendency to give personality and separate activity to the Yeẓer, as in the case of the angel of death and of Satan, with each of whom, indeed, it is identified (B. B. 16a). 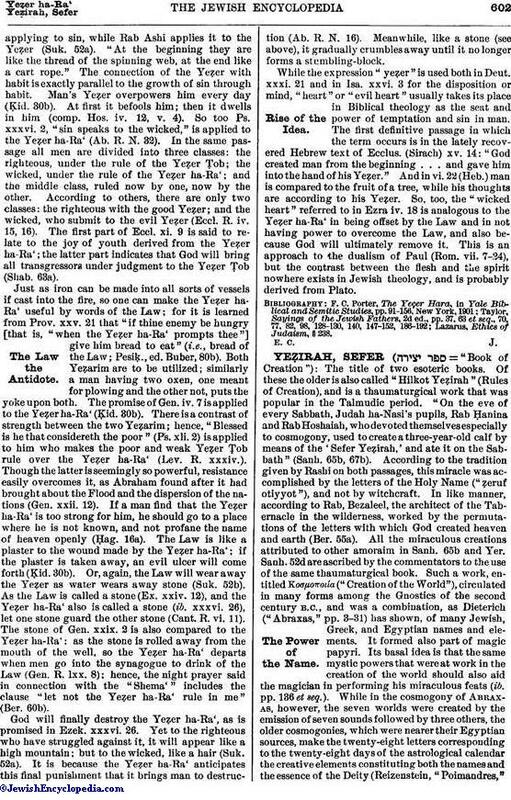 Objections to the Law which in Sifra 86a are attributed to the Yeẓer are in Yoma 67b attributed to Satan. According to R. Jonathan, the Yeẓer, like Satan, misleads man in this world, and testifies against him in the world to come (Suk. 52b). Hence in the prayers one asks to be delivered "from evil man and from evil act, from evil Yeẓer, from evil companion, from evil neighbor, and from Satan" (Ber. 16b). Here, however, the Yeẓer is clearly distinguished from Satan. On other occasions it is made exactly parallel to sin. Thus, in Gen. R. xxii. 11 the parable of II Sam. xii. 4 is applied to sin, though elsewhere it is applied to the Yeẓer (see above). Similarly, Akiba interprets Isa. v. 18 asapplying to sin, while Rab Ashi applies it to the Yeẓer (Suk. 52a). "At the beginning they are like the thread of the spinning web, at the end like a cart rope." The connection of the Yeẓer with habit is exactly parallel to the growth of sin through habit. Man's Yeẓer overpowers him every day (Ḳid. 30b). At first it befools him; then it dwells in him (comp. Hos. iv. 12, v. 4). So too Ps. xxxvi. 2, "sin speaks to the wicked," is applied to the Yeẓer ha-Ra' (Ab. R. N. 32). In the same passage all men are divided into three classes: the righteous, under the rule of the Yeẓer Ṭob; the wicked, under the rule of the Yeẓer ha-Ra'; and the middle class, ruled now by one, now by the other. According to others, there are only two classes: the righteous with the good Yeẓer; and the wicked, who submit to the evil Yeẓer (Eccl. R. iv. 15, 16). The first part of Eccl. xi. 9 is said to relate to the joy of youth derived from the Yeẓer ha-Ra'; the latter part indicates that God will bring all transgressors under judgment to the Yeẓer Ṭob (Shab. 63a). Just as iron can be made into all sorts of vessels if cast into the fire, so one can make the Yeẓer ha-Ra' useful by words of the Law; for it is learned from Prov. xxv. 21 that "if thine enemy be hungry [that is, "when the Yeẓer ha-Ra' prompts thee"] give him bread to eat" (i.e., bread of the Law; Pesiḳ., ed. Buber, 80b). Both Yeẓarim are to be utilized; similarly a man having two oxen, one meant for plowing and the other not, puts the yoke upon both. The promise of Gen. iv. 7 is applied to the Yeẓer ha-Ra'(Ḳid. 30b). There is a contrast of strength between the two Yeẓarim; hence, "Blessed is he that considereth the poor" (Ps. xli. 2) is applied to him who makes the poor and weak Yeẓer Ṭob rule over the Yeẓer ha-Ra' (Lev. R. xxxiv.). Though the latter is seemingly so powerful, resistance easily overcomes it, as Abraham found after it had brought about the Flood and the dispersion of the nations (Gen. xxii. 12). If a man find that the Yeẓer ha-Ra' is too strong for him, he should go to a place where he is not known, and not profane the name of heaven openly (Ḥag. 16a). The Law is like a plaster to the wound made by the Yeẓer ha-Ra'; if the plaster is taken away, an evil ulcer will come forth (Ḳid. 30b). Or, again, the Law will wear away the Yeẓer as water wears away stone (Suk. 52b). As the Law is called a stone (Ex. xxiv. 12), and the Yeẓer ha-Ra' also is called a stone (ib. xxxvi. 26), let one stone guard the other stone (Cant. R. vi. 11). The stone of Gen. xxix. 2 is also compared to the Yeẓer ha-Ra': as the stone is rolled away from the mouth of the well, so the Yeẓer ha-Ra' departs when men go into the synagogue to drink of the Law (Gen. R. lxx. 8); hence, the night prayer said in connection with the "Shema'" includes the clause "let not the Yeẓer ha-Ra' rule in me" (Ber. 60b). God will finally destroy the Yeẓer ha-Ra', as is promised in Ezek. xxxvi. 26. Yet to the righteous who have struggled against it, it will appear like a high mountain; but to the wicked, like a hair (Suk. 52a). It is because the Yeẓer ha-Ra' anticipates this final punishment that it brings man to destruction (Ab. R. N. 16). Meanwhile, like a stone (see above), it gradually crumbles away until it no longer forms a stumbling-block. While the expression "yeẓer" is used both in Deut. xxxi. 21 and in Isa. xxvi. 3 for the disposition or mind, "heart" or "evil heart" usually takes its place in Biblical theology as the seat and power of temptation and sin in man. The first definitive passage in which the term occurs is in the lately recovered Hebrew text of Ecclus. (Sirach) xv. 14: "God created man from the beginning . . . and gave him into the hand of his Yeẓer." And in vi. 22 (Heb.) man is compared to the fruit of a tree, while his thoughts are according to his Yeẓer. So, too, the "wicked heart" referred to in Ezra iv. 18 is analogous to the Yeẓer ha-Ra' in being offset by the Law and in not having power to overcome the Law, and also because God will ultimately remove it. This is an approach to the dualism of Paul (Rom. vii. 7-24), but the contrast between the flesh and the spirit nowhere exists in Jewish theology, and is probably derived from Plato. Lazarus, Ethics of Judaism, § 238.